Summon your wind-up Bartz minion. I like small Bartz and I cannot lie. 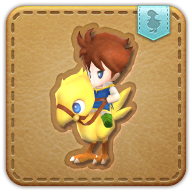 The legend of Bartz and his trusty chocobo steed Boko is known far and wide, their journeys inspiring entire generations to adventure. Though, disagreement as to the appropriate spelling of the carefree youth's name has led to many a hurt butz.